In Microsoft Dynamics CRM we’ve got several places that documents relating to an account can be uploaded to SharePoint. Some are custom solutions developed whilst we were using CRM4 and others are using the built-in CRM2011 SharePoint integration. To keep things simple for users, I have created a SharePoint web part that allows them to see a consolidated view of documents relating to each account. This web part has a menu against each document that allows users to open the record that the document was uploaded against. This creates an iFrame that loads from html shim from CRM which in turn calls Xrm.Utility.openEntityForm using the typename and id passed from SharePoint in the query string parameters. The shim is simple enough that it can be used on any page that is hosted on any site other that CRM. It could be extended to call any Xrm object model methods provided by ClientGlobalContext.js.aspx. The integration testing is concerned with testing customisations within the context of CRM to ensure that the various components work together correctly. In my current work this is mostly related to custom plugins in CRM and custom integration with SharePoint. The key point is that with this type of testing I am not concerned with the user interface, rather the underlying processes. In many ways the integration tests are very similar to the unit tests, they are code based test created using the Gallio/MbUnit framework. However, instead of testing code in isolation and mocking dependencies, the integration tests test whole systems. This is achieved by making create, update, delete, etc. calls to the web service to simulate user actions. Test setup and tear down code can become length as you need to be able to setup scenarios to be able to test, including creating test records and enabling/disabling plugin to allow actions to be performed that may otherwise be blocked. It is also during integration testing that I introduce testing as specific users to test security related constraints. This is easily achieved in CRM as connections to the Organization Service support impersonation. Integration tests are also good where a user has identified an issue with a plugin in a scenario you hadn’t thought of before. I tend to use this as a trigger to create new integration test to match that case, and then one or two more boundary cases around it. As these tests require connection and interaction with CRM, they can be slow to run. As a result, I tend to run these in TeamCity, where they can be left to run on their own, or I will run specific tests in order to help track down an issue. Whilst setting them up may seem to take a long time, relative to “productive development” time, they soon become invaluable for regression testing as new functionality is developed or existing code is refactored to improve performance, etc. In this example you can see that the test is disabling a plugin, setting up some test address records, re-enabling the plugin and then executing the test. After the test is complete it cleans up the test records. Ideally the code being tested should not rely on external resources, where such dependencies exist they should be mocked to isolate the code being tested form the external system. In the case of plugins, this means that testing units of code should not require the code to have a connection to an actual instance of CRM. This means it is simple to mock the CRM services to test the plugin in isolation. However, mocking a whole execution context would be a bit of a lengthy exercise, especially the IPluginExectionContext object is different depending on what messages and what pipeline stages you are writing the plugin for. A plugin that you register in CRM as you will register your final plugin (including configuring pre- and post-images) that serialises the plugin execution context to xml files. A library of classes for de-serialising the xml files into objects that match the IPluginExecutionContext interface. 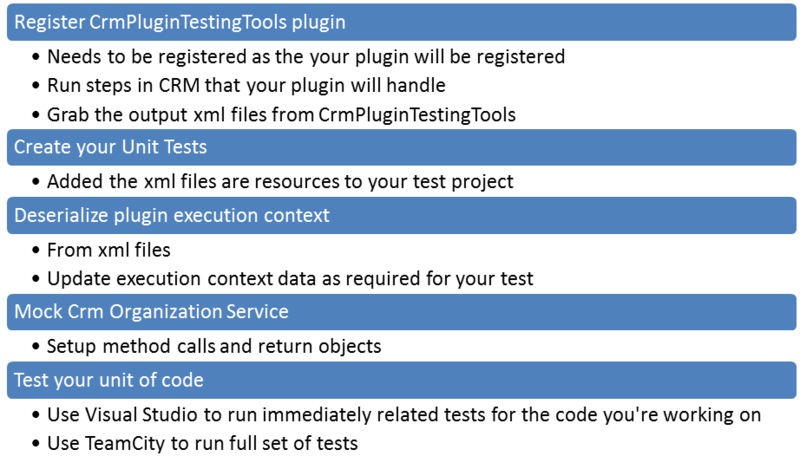 Once you’ve registered their plugin, perform the steps that you plugin will handle; grab the output xml files; head into Visual Studio and start crafting your unit tests. I tend to use the de-serialized xml files in my unit tests as a starting point and then use the object model to update the IPluginExecutionContext objects to structure the data for the specific test. 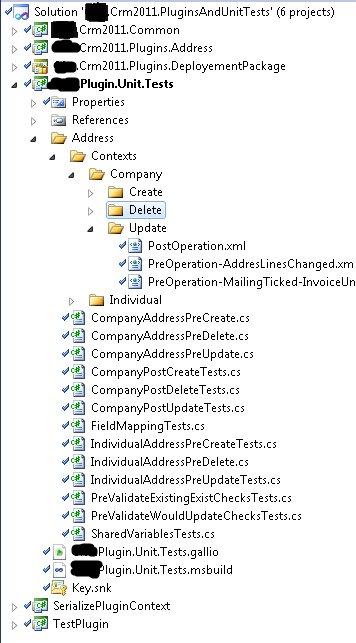 The execution context is only half of the story, I also use Moq to create a mock IOrganizationService that code being tested will be given instead of an actually connection to CRM. By doing this I am able to isolate the code from the CRM server plus I can determine what will be returned without having to setup records in CRM. I can even mock any type of exception if I want to test that aspect of my code. 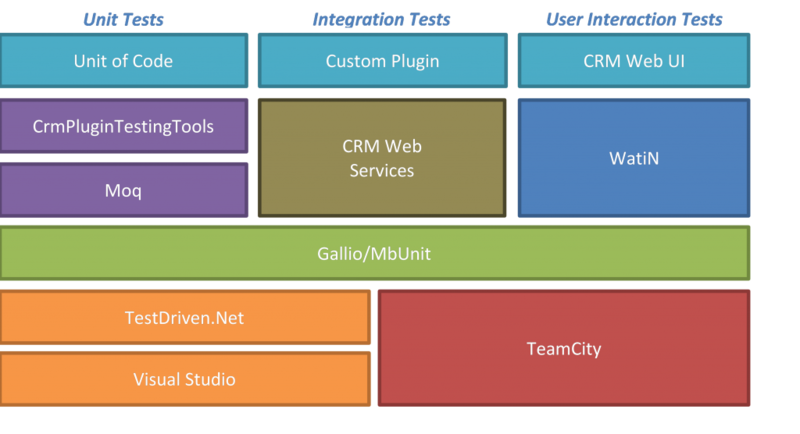 As with all my automated tests, the unit tests are built on top of Gallio/MbUnit testing framework. This means that I don’t need to think about how to run the tests, I know they will all work with TestDriven.net in Visual Studio, the Gallio Test Runner – for a more graphical UI on my workstation, and TeamCity continuous integration server. Of course, the plugins I write and single-class monsters, instead I break up the code in logical units (classes/methods) of responsibility and I test each unit on its own. If a unit of functionality doesn’t require access to CRM or the plugin execution context then I don’t worry about mocking those for that specific test. This contains the early-bound classes generate by CrmSvcUtil.exe which are used by several solutions. The plugin that is being written/tested. The project for deploying the plugin into CRM. The steps and images registered in this project should match how the CrmPluginTestingTools plugin was registered. This contains the unit tests created for testing the plugin, as well as the serialized execution contexts used by the unit tests. This project also contains a .gallio file that is the project used to run the tests in Gallio; and a .msbuild file that is the MsBuild project used to compile and run the tests in TeamCity. The CrmPluginTestingTools projects for de-serializing the xml execution contexts in the unit tests. The above code is a single test fixture (class that contains unit tests); a SetUp method that is run before each test; and a single unit test. I have added Metadata attribute to the test method so the setup method can determine which execution context xml files should be de-serialized for the test. The first two lines of the test setup and execute the plugin, the rest of the test ensures that the ShareVariables on the execution context have been correctly set of the given data. e.Attributes.Contains("address1_line1") && (string)e["address1_line1"] == ""
e.Attributes.Contains("address2_line1") && (string)e["address2_line1"] == ""
By using unit testing in isolation of CRM, it is possible to create the vast majority of a plugin without having to touch the CRM server itself (with the exception of creating the test serialized execution contexts). Not only that, once you have created the unit tests, it is possible to run them again and again without having to manually click through CRM, so if you make changes to entities in CRM you can easily re-run the CrmSvcUtil.exe to update your early-bound classes and then run the unit tests to verify that they still pass. 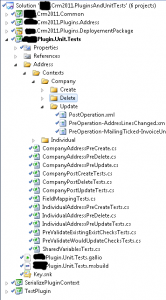 To mark my return to blogging, I’ve decided to write a series of blog posts around automated testing in CRM2011. This is part 1, an overview of the types of tests I’m creating and the tools I’m using for creating and running the tests. Future posts will look at each of the types of tests in turn and look at how I’m using TeamCity to automate these tests. These are small, fast tests that are written in code and are designed to test isolated pieces of code. The tests are for complete systems or sub-systems, e.g. a plugin running in the context of CRM. However, they are still code based and tested in without User Interface interaction. This is tests of the system from the perspective of the user. They are based on a simulation of the user clicking and entering values in the browser. Used for creating the test classes and test runner used for executing the tests. This is used to create copies of actual plugin execution contexts from CRM. These are then used in plugin unit tests outside of CRM. Used for creating mock copies of external systems, e.g. CRM Web Services, so that unit tests do not require access to CRM. This is a web browser runner that simulates a user clicking in the browser. This integrates testing functionality into Visual Studio, making it quicker and easier to write and run tests from within Visual Studio without having to rely on an external application. This is an automated continuous integration system that is used to both compile the source code and run unit tests. It has also been configured to create a backup of the customisation solution from CRM into Subversion. All of the test can be run in either Visual Studio or TeamCity and all of the test are based on the Gallio/MbUnit test framework. 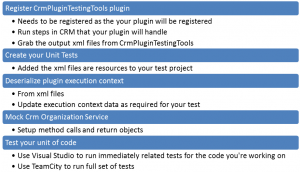 In addition, the unit tests uyse Moq and CrmPluginTestingTools to allow the unit tests to run in isolation; the integration tests simply call straight to the CRM Web Services for both setting up the test and confirming the results; the user interaction tests use WatiN to control IE to run the test. As part of a Microsoft Dynamics CRM customisation project, I was recently tasked with modifying an ISV add-in page so that individual sections of the page could be refreshed without having to refresh the entire page. That in itself was nice and easy, it just required the use of a couple of UpdatePanel and UpdateProgress controls to be dropped on the page along with a ScriptManager control to handle the partial postback requests. Start load of Application Status section. Start load of Risk section. Start load of Alerts section. Unfortunately, the ScriptManager that comes with ASP.Net AJAX only handles one postback at a time. Any subsequent postbacks take precedence over earlier request, which is fine if you only have one update panel on a page but this initially resulted in only the Alerts section being loaded – the other postbacks being canceled. Luckily I found a very useful post on Amit’s Blog: Asp.Net Ajax UpdatePanel Simultaneous Update. This post provides code that queues postback requests. Ideally I would have liked to have the requests happening at the same time, but this is the next best thing. This means that each time the section is updated I can re-generate the script and it will be executed again. With this AJAX loading and some enhancements to the SQL code, users now get a much fasted load and response time for the page as the no longer have to wait for the whole page to be rendered before seeing information appearing on the page.